when my friend yen mentioned the words "pyesta", "inuman" and "ibajay" in the same sentence while we sat in the dining room of the previous aklan governor's home in kalibo last year, i knew immediately that i had to write it in my festival calendar in bold, black ink. 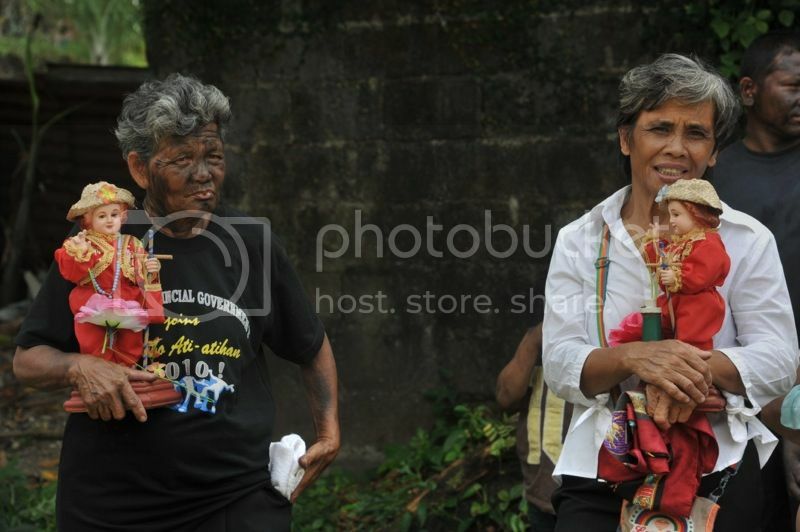 lately, i've been busy looking up small-town celebrations where the spirit of fiesta is kept alive, and the ati-ati festival in the sleepy town of ibajay seemed perfect. ibajay is between kalibo and caticlan, a mere 45 minutes via public transport from the bus station near the airport. we paid a measly 65 pesos for the bus ride, and between that time until we checked out of the aklan state university hostel, we spent close to nothing. it was quite a challenge finding accommodations in the town; yen didn't know of any, while the previous provincial chief of police could only suggest a hotel in the next town of nabas. i decided to call up the tourism office of ibajay to inquire, and they suggested we book a room at the ASU. apparently, its ibajay campus has programs in tourism and hotel and restaurant management, and students received training on maintaining a hostel there. whether they'd actually learn any skills useful to the hotel industry is doubtful, but given it was the only one available, we didn't really complain. on our way to ibajay, social media facilitated a series of serendipitous events, which in sum could be considered as providential. my companion, RA, found a photo on instagram posted by his fashion designer friend which revealed the latter's location: he was also in aklan. it turned out that cherry, the designer, is actually from ibajay. i glanced at RA 's phone while he texted and found that his designer friend's last name was familiar, so i said: ask your friend if he's related to charlie. it turned out that charlie, who has a doctorate in american studies from yale university and who was a classmate in UP diliman from as far back as 1995, and who wrote for the kultura section of the philippine collegian while i was with its news and features section, is his older brother. i always knew that charlie was aklan-born and raised, but i didn't know he was from this (not so) tiny town. what a coincidence, i said. but what i didn't know was that charlie would also be there in time for the fiesta, lording over a huge outdoor kitchen as their home welcomed hordes of visitors and relatives who came for the festival. on our first night in ibajay, cherry invited us to join his elementary school's homecoming, which happened just across the street from their house. in a small town like ibajay, few things take place, so this was a good place to start 3 days of parties. i had chucked a small sigg bottle filled with absolut vodka into my backpocket, and although we were a little shy at first, pretty soon, we were out on the grass lawn, dancing to the tunes played by a local band. the homecoming was hosted by batch 88, and naturally, standards from that time were being played. i was only in 5th grade in 1988, but i knew the songs, and in some cases, even the dance steps. i knew absolutely no one there, save for RA, cherry, and his other siblings (charlie was too tired to join the homecoming), and i enjoyed the anonymity that ibajay extended to me. pretty soon, i heard that familiar question: abogado ka ba talaga? if it hadn't rained that night, we would have kept dancing, particularly since we latched on to a train of people doing the snake dance around the grass quadrangle. we stepped out of the school when the downpour fizzled, found a place that sold burgers after midnight, and were then dropped off at our hostel. the following day we were told to get up early and have breakfast at the verics. we arrived at the same time that two other tricycles did: one carried 4 lechons wrapped in manila paper, the other had two freshly-butchered pigs, one of which was carried into the veric household, while the lechon was taken to the house across the street. i immediately asked about the things that would take place that day. 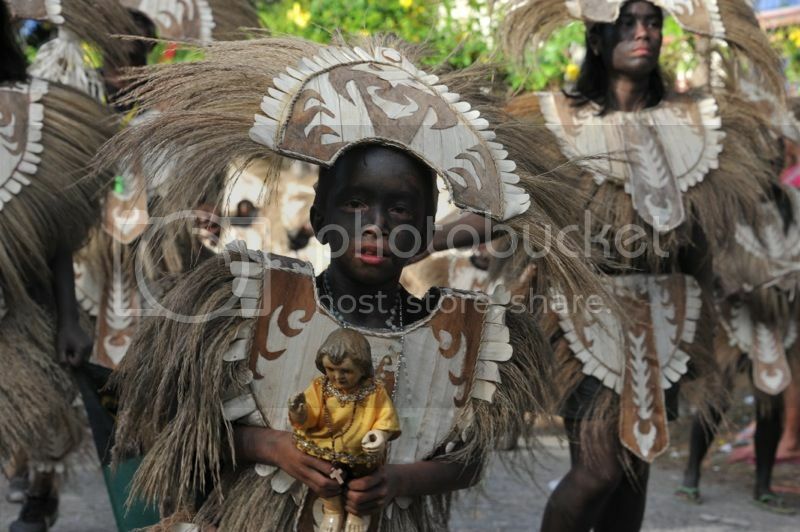 already, the streets around the parish were filled with the sounds of parading drums and xylophones, while people, many of them with faces blackened by soot or charcoal, walked around carrying images of the child christ. charlie told me that the translación -- the act of moving the blessed image of the santo niño from the convent to the parish -- would happen around 11am. i decided to go a little earlier and found that the pews inside the parish had been pushed out of the side doors. outside the parish, gangs of percussionists were competing for my ears, and their melodies were drowned by the battle. a group of gay men in fantastic costumes were parading outside the convent, and the faithful were either inside the parish or outside the convent, waiting for the moment when the case carrying the santo niño would be moved. 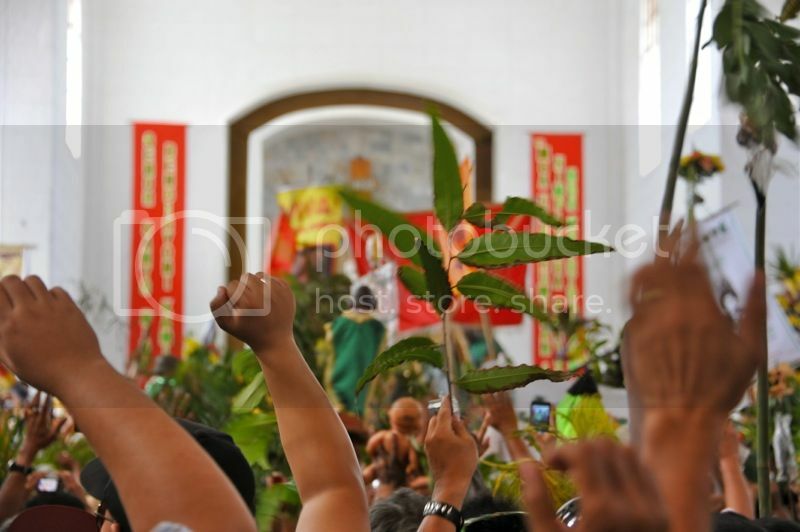 the faithful were carrying sticks where they've attached an assortment of edible things: from an entire roasted chicken or dried fish wrapped in plastic to carcasses of crabs. charlie's brother snapped a long branch from a plant in their garden and taped a pack of cookies just below its crown of long leaves. i was told that they were for the santo niño -- i forget now though what these offerings were for, but they are probably linked to sacrifice. the clashing bangs and tings were already heavy in the air when suddenly the noise trebled, and the sea of religious devotees raised their hands and waved the sticks where they've crucified birds and sea creatures. i was pushed aside to make way for rows of kids in warrior costumes, carrying shields and spears and swords, skittling, so it seemed, back and forth in an unrehearsed dance, as a group of men huddled under the weight of a small carriage that kept the image of the santo niño. i was just looking at the wild procession as people screamed viva! 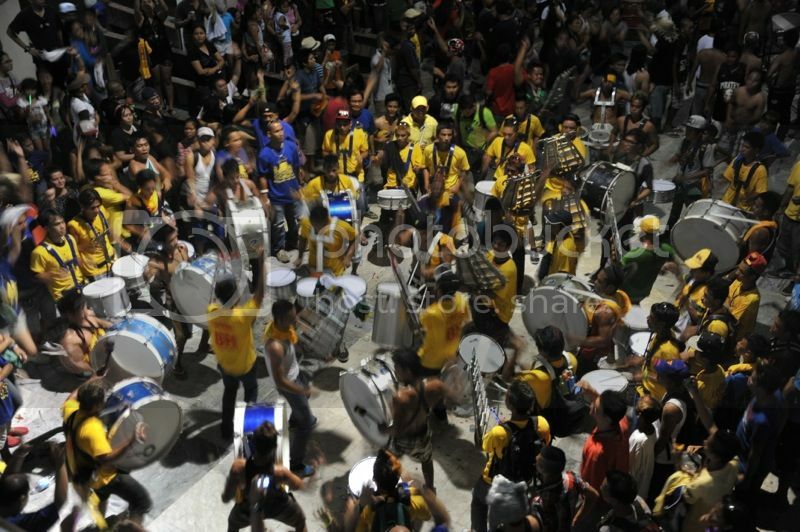 loud enough that the sound of drums was nearly drowned. 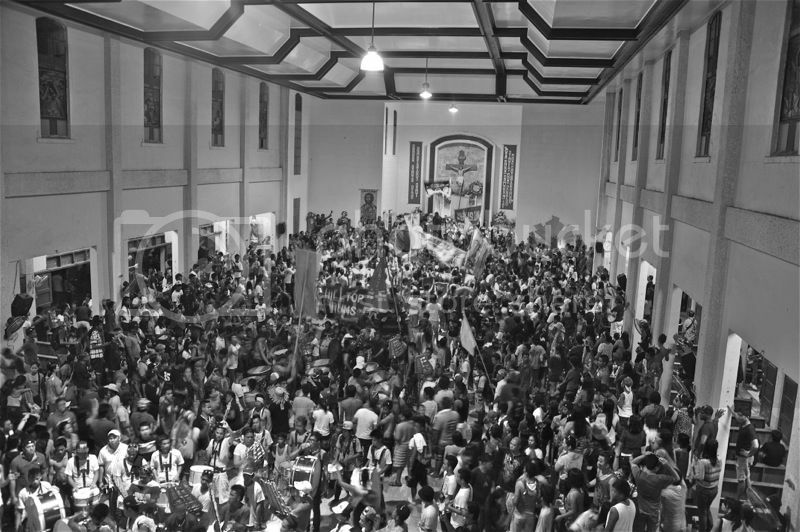 i looked on from a safe distance until i felt the crowd around me transform into a throng that followed the santo niño as it made its way inside the parish. i shuttled my feet as bodies moved behind the carriage, and as this went on, shades of stampede crossed my mind and i feared i might lose a slipper or get trampled under the feet of the faithful. inside the parish, the men who carried the carriage struggled to put the glass box on top of a pedestal as hands stretched to touch the image. people kept streaming into the parish that i wondered whether its capacity would be breached and suddenly the roof would crumble under all that weight and noise. 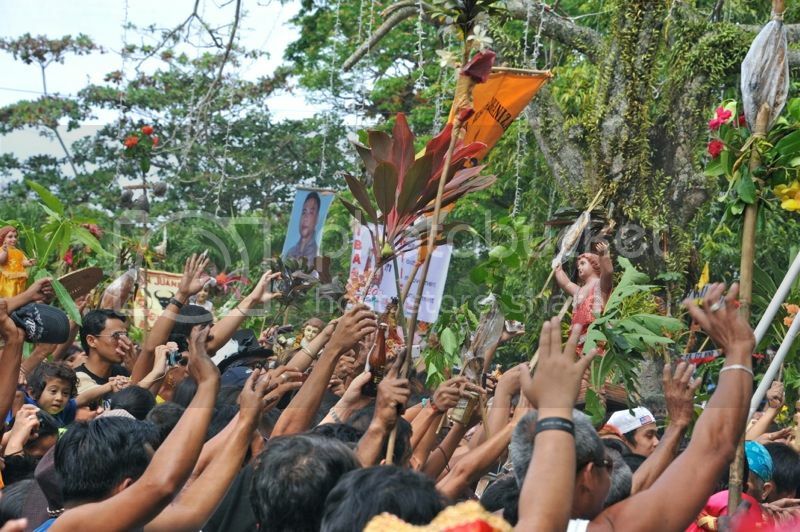 when the santo niño was firmly put in place, the adoring crowd screamed viva! once more, and the air over our heads were filled with leaves and food and images of a caucasian child with long curly hair. 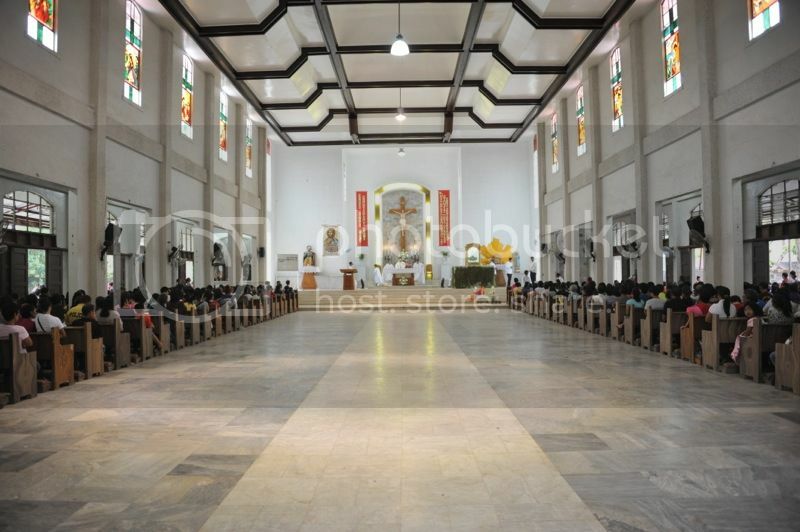 the statues of the santo niño varied in sizes, anywhere between the equivalent of toddlers and of pendants. cherry himself holds on to an image made of pure gold, which fits right in the palm of his hand. under the high walls of the parish, the noise of drums was magnified that i could still hear them as i walked away to lunch at the verics. later that afternoon, glenn arrived and for lack of anything else to do, we decided to join a group in the ritual sadsad. 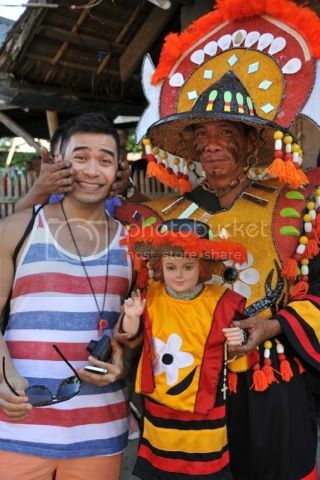 the legend of ati-atihan tells us that after the natives of panay island were converted to catholicism, the spanish friars gifted them with an image of the santo niño. they carried this image to the church, while the villagers followed, dancing and prancing and stomping their feet. 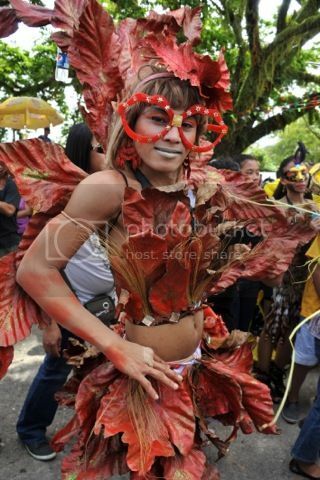 the villagers were atis, early settlers to the islands who had dark skin and curly hair: that is why revelers color their skin with soot or charcoal or the black from the bottom of a pot to remember the festival's beginnings. during dinner at the mayor's house, a woman told us another version. she said that many years ago, a fisherman found the head of a statue caught in his net and brought it to the village priest who said it was the face of the child christ. they garbed the religious image in rich cloth and celebrated its miraculous discovery, and since then, the festival of the ati-atihan began. 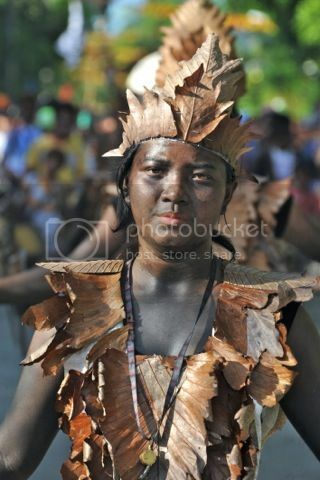 ibajay's ati-ati, she claimed, originated the festival, versions of which are being celebrated in kalibo, iloilo, and tondo, because her grandmother, would she have been alive today, was already doing the sadsad when she was a little girl. 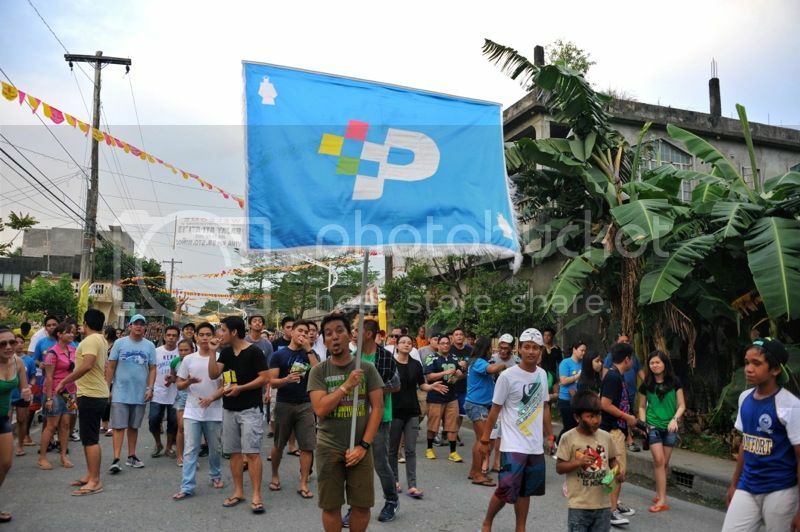 we wound up circling the town with a group of young people from many parts of aklan and manila. 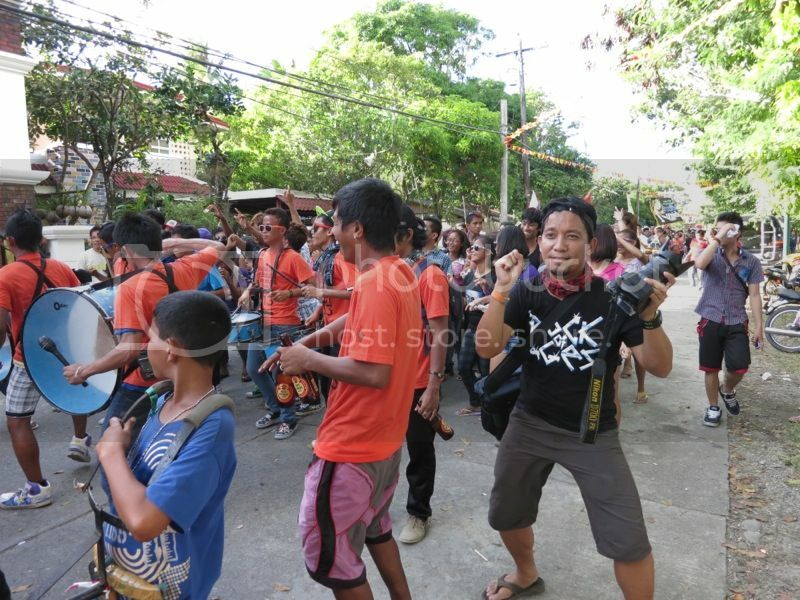 later that evening, we would learn that many of them were friends of the mayor's son -- classmates from school, visiting ibajay to celebrate the town fiesta. cherry wasn't too keen on finishing the sadsad, but us being visitors, we wanted to see where the street stomping would take us. it ended right in front of the mayor's house, where we were invited for dinner. we knew no one there but did not decline the invitation. the mayor's house was open to everyone, but we had the distinct honor of being invited into the inner courtyard, reserved, so our host jay claimed, for special guests. for the next two days, we would divide our meals between the verics and the mayor's house. that evening, we descended upon the plaza to watch as they crowned a new ms. ibajay and also to wait for the dancing to begin. it rained again that night, but it did not stop us from going wet and wild. if i hadn't been entrusted with everyone's gadgets, i would have been myself dancing in the rain. the following day, we were bugged about having breakfast at the mayor's, but were too tired to peel ourselves out of bed so early in the morning. when we finally arrived in time for brunch, our host scolded us for arriving late, and apologized that they'd run out of food. there was still enough for a battalion of soldiers. we waited for the final sadsad, an excuse to booze on the streets, really. there were a few groups in costume here, and most were troops of friends, each with its own percussion band, and at least one person designated to carry the alcohol. the barangays even had floats featuring the products their villages produced, like ducks or rice grains or crabs. at the end of this long procession is the carriage of the santo niño, which is paraded around the town, taken back to the parish, and then kept within the confines of the convent, to be seen only by a few until the next festival. again we ended up with the group with the most manileños. they were well-oiled, and another of the mayor's sons, who also held a post in the sangguniang panlalawigan, offered me several shots of johnnie walker double black, easily the most disgusting brew i would ever taste during that sadsad. as many other fiestas in other parts of the country are turned into colorful parades with corporate-sponsored dance troupes eager to outperform each other in competition for a huge sum of money, ibajay's ati-ati festival brings us back to the basics and reminds us of how it all began, and probably how it should be: people filled with fervor, whether for the image of the santo niño or to a bottle of san miguel, open their doors to friends and strangers to share blessings and be grateful for their borrowed lives. i am neither catholic nor religious, and while i profess a faith and spirituality, i confess to having no great devotion to anything that is intangible. but i would be lying if i say that the translación had not affected me in a strangely profound way, or that the sadsad made me rethink my role as spectator. i saw people cry inside the parish, and i also witnessed others dance wildly as though dancing itself were a form of praise and worship. the following day, before leaving ibajay to journey onwards to caticlan, we went to the poblacion one last time to have lunch. the streets had been cleaned and cleared of any sign of the previous days' celebrations. the town suddenly had this barren, empty feeling, as though we would never again hear the bang of drums in its streets. and this is the attribute of far-flung fiestas that makes me want to leave the unfriendly streets of the cities i grew up in to participate in government-sanctioned debaucheries. a few days in a year, these sleepy towns are roused from slumber, suddenly misbehave and get more than a little crazy, which is a not-quite-accurate allegory of my life.